Northwest of Bristol, in traditional Gloucestershire. It meets the M4 at junction 22 and the M5 at junction 18A. This is yet another candidate for the daftest full-blown motorway. OK - what is it this time? Well, it really doesn't deserve to be a motorway in its own right. Oh no. You're making no sense again! I suppose it is only its length that means that it has its own number. Oh yes, and the number it has got is wrong, or more technically "out of zone" - motorways south of the M4 (and west of the M3) are supposed to start with a 3.... However, given that the M49 is the only motorway that lies south of M4, but west of M5 it's impossible to be certain. As a piece of trivia, it means that this is also the only motorway without a "start of restrictions" signpost (as seen on the pages of the other motorways on this site), as you're already under motorway restrictions whenever you join. So, it's pretty daft then? My apologies for the occasional dark one though - the light was failing and it was raining! I'm surprised you haven't mentioned that the junction of the M49 with the M4 commits yet another crime - a roundabout! Even worse, is that the right turn off the roundabout onto the eastbound M4 is completely pointless, as if you wanted that you'd have carried onto the M5 / M4 junction anyway! It provides a useful diversionary route (M5/M49/M4/M5) when the M5 around Bristol is busy (which is often) or closed (which is often enough to be a pain). More such diversionary routes would help reduce general congestion due to incidents. It reduces the amount of traffic using the M5 around Bristol, by removing the long distance M5 north to M4 east and M4 west to M5 south traffic. This is especially useful due to the poor junction design for M5 J16 (A38) and M5 J15 (M4). As these junctions are about half a mile apart, M5 to M4 traffic has to cross A38 to M5 traffic, which is very hairy. The M49 reduces the amount of M5 to M4 movements and so reduces the conflict. The M49 removes around 7 miles from trip between Wales and the Southwest, which is good for environment !!!! For a friend of mine who commuted from Magor to Portbury every day, this cut the trip by a third (and halved the time it took). So not much of a motorway, but a very useful one. I seem to recall that when it was first planned, there was a proposal for a junction around two-thirds the away along (starting on the M5) to serve to new industrial estate as well as joining the Avonmouth road. I suspect that the estate owner could not afford the cost, so it was dropped before being built (there is no sign of a proposed junction on the ground). Does anyone know how much the eastward pointing M4 sliproads at the M49 junction actually get used? And for what purpose by drivers? Not very much normally. In commuting up and down the M5 for the last 2 years, I have used the M49/M4 as a diversionary route perhaps half a dozen times a year, due to congestion on the M5. During that time, the M49 has twice been used as a diversionary route due to accidents on the M5 causing it to close (both on the hill just north of the M5 J18). In this case, those eastward sliproads were very useful. Off the top of my head, I would estimate that around 5-10% of the traffic on the M49 uses these slip roads. What I find odd is that the northern end of the M49 is a plain roundabout junction but the southern end is *almost* fully free-flow. It provides a very useful extra option from the M4 Westbound onto the M5 Southbound when the left turn lanes at the M4/M5 interchange are snarled up. There have also been plans for a junction to be provided if a Football Stadium is built at Severnside - however this looks extremely unlikely. You can also be welcomed to England (or Croeso i Loegr in Welsh) on the M49 without ever leaving the country! While browsing the site, I noticed many people questioning the need for the eastward facing slip roads on the M4 junction with the M49. Initially they do seem pointless until one day I needed to drive to Cardiff from Exeter. I of course went up the M5 and turned onto the M49. Only as I approached the M4 junction was I treated to a sign that gave me a bit of shock! The tolls for the Severn bridge are horrendously high (I imagine this is because they only charge you for entering Wales, and its free to drive into England)!!! The toll is like £4.50 for a car - and £13.50 for a HGV. There is no warning before you turn onto the M49, so anyone needing to get to Wales and didn't think the bridge toll would be so high can turn east onto the M4 and find somewhere to get some money out! Plus this serves the same purpose if you're on the M4 travelling west, so allowing you to turn around before the bridge. As for the M48, it already has a junction where you can turn off before the bridge just in case. Plus it has the added bonus of helping out the bypassed section of M5 if it ever needs to close. I personally think this makes this junction evidence of some clever thinking (for once) in the road planning department!!" I've never been on it but if it was built to divert road users from the M5 south of Bristol why not build a link road north of Bristol? Hi, commenting on the M49. I thought it would be of interest to people unused to the area to be aware of an, as yet, unmentioned hazard at the roundabout on the northern end of the motorway! I would assume that, normally, motorists using the M49(N) would be intending to use the SSC to enter Wales, requiring a left turn, 1st exit, at the above roundabout. What the unwary (blind) may fail to notice is that you leave a dual carriageway motorway & join a single carriageway (no central white lines) slip road up to the M4 SSC. BEWARE THE BIG LORRY ! DO NOT ATTEMPT TO TURN LEFT AT THE ROUNDABOUT FROM LANE 2 IF THERE IS A BIG TRUCK IN LANE 1 !! There is NOT enough road width. And, especially if I'm driving the truck, you WILL be run off the road. This has happened at this junction, there are no "road narrows" warning signs !! Also, if driving something large/heavy/unstable, there are no "sharp bend" signs either...... & IT IS! Road planners, don't you just luv 'em? Said link road does exist, its just a bit further North than you are looking, its the forever great M50/A40/A449. Just a point and, really it could be said about any stretch of motorway in the UK. Back in November 2004 the M4 was closed between junctions 19 and 20 (M32 and M5) (yes there is a point to this). Now, if the closure had have been between junctions 20 and 21 (the M5 and M48), The M49 would have proved and earned its way into the the list of important motorways, as it would have provided a through route while the M4 (Or M5 whichever is closed) to be repaired. Ok its probably a one in a million but does have uses after all. As someone who commutes daily from Bristol to Cardiff, I use the entire length of the M49 in both directions every day. On my way home, coming from Wales, I come down off the SSC to the roundabout at which I turn right to go along the M49. In theory, I can think of no reason why I would ever have to give way to a car at this roundabout. As has been pointed out in other posts, there is no logical reason why anyone would go along the M49 and then turn East back towards Bristol (unless the M5 is closed). Yet, by my estimate, I have to give way to someone doing precisely this manoeuvre about once a fortnight. Given that it only takes me about 20 seconds to negotiate the junction, and I meet someone about every tenth journey, I can only conclude that there are far more people making 'pathetic' right turns than is otherwise realised! 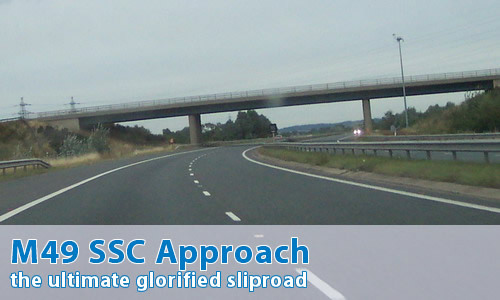 It must be said, from the information that I have gleaned from the site's report and viewer comments that although this motorway is pretty pathetic, and I fully support it being here; it serves several very useful functions and I believe that we should champion this rare occasion of clear thinking on behalf of the Transport Ministry. There is another pathetic aspect about this motorway. If you are travelling from South Wales to Bristol airport, there is a sign on the Severn Bridge saying, "For Bristol Airport, use M49". However, this sign is very easy to miss as it is just at the start of the bridge. When approaching the M49 junction from the bridge, the signs do not mention the airport. There is not even a plane symbol. At the next junction (M5), Bristol airport is prominently signed via the M5 South. Another part of the conspiracy to keep us away from the M49?! The M49 might be pathetic but it can be very useful. When heading from M4 westbound to M5 southbound you face huge queues of traffic. However if you carry on to the M49 (empty) you miss out 5 miles worth of queues saving a lot of time. I used to regularly travel from Berkshire to Devon and the M49 was often the route of choice. Negotiating the Bristol part of the M4 during roadworks or when the shopping centre was chucking out at Bank Holidays or Christmas could be a nightmare. It is a lot more relaxing driving for 10 or so mins extra on an empty motorway than sitting in traffic past the Aztec centre. I now live in Devon with family in Wales and hence use the M49 for that, but still choose it as the route towards M4 Eastbound at peak times. I note comments regarding there being no junctions for the M49 and historic proposals for an employment site. See link to the South Gloucestershire Local Plan Adopted in 2006. Policy E2 relates to development at Severnside and comments on the history of the site. Policy E2C and Paragraph 7.34 discusses the developer funded requirement for a new motorway junction along the M49 to serve the development as indicated in Figure 7.8. I believe the reason that the eastbound slip road exists is to provide a diversion route should the Second Severn Crossing be closed. I can only recall this ever happening once when a person was threatening to throw themselves off the bridge. I'm pretty sure that the prism signs directed traffic off the M4 westbound, around the roundabout and backup the eastbound slip road.